Nite Owl Creates: Win a BluApple! Giveaway!! In an effort to stay healthier we've started to eat at home more. This has been a struggle for us for YEARS! Along with eating healthier is buying produce. Some produce likes to go bad faster than others, and its a lot of wasted money. Wasted money just frustrates me. Part of our eating at home efforts are to save money as well. The BluApple product from Aureus Product Innovations can help us out! They sent me one of their products to test out. Go visit their website HERE. We immediatly put these cute little things to work! We put one in the crisper in the refrigerator and the other on the counter where we keep some fruits at times. It used to be our produce would go bad in a day or two. Some things we've had in there a week, and its still good! This helps me, so I don't have to go to the store EVERY SINGLE DAY, and spend more money on food that I probably won't eat. 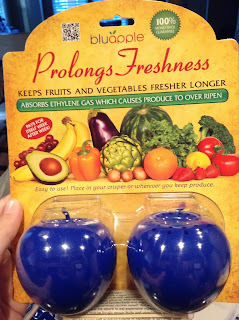 :) So if you've ever wished you could keep your produce around a little longer, then these are for you! Read a little bit about them below, and then visit their site, and enter the giveaway for more information as well! Ethylene gas is given off by all living plants, especially by fruits, vegetables and flowers, and acts as a chemical signal to speed up the ripening process. The release of this gas is thought to be a mechanism by which plants promote uniform ripening or opening, etc. In nature, the uniformity of these events attracts the maximum number of pollinators or seed disseminators, such as birds and insects. At home, however, when you store your fruits and vegetables in the refrigerator, ethylene gas builds up. As a result the ripening process is accelerated too quickly. This is a major reason we all throw out so much spoiled produce! 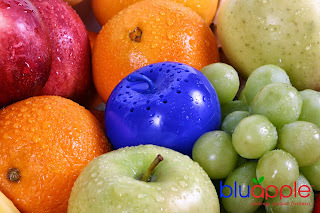 The Bluapple is based on technology that has been used in ships, warehouses and trucks for many years to absorb and neutralize ethylene gas buildup. The Bluapple does not release any gas or chemical, but only absorbs, constantly removing this harmful gas from your produce storage area. The Bluapple is not a "magic" pill, but a scientific and essential part of keeping produce fresh. When produce was cheap, no one cared, but as prices have risen, it became apparent that a very beneficial product for the home could make a huge difference. There are three key elements to long produce life: a) temperature - keeping produce cold; b) humidity - using vented plastic bags to keep a moist, but not wet environment; c) ethylene gas management - using the Bluapple. Disruption of any one of these elements will cause premature spoilage. It may interest you to know that we provide a money back guarantee, which we are proud to honor. After selling many hundreds of thousands of Bluapples, they have processed less than 50 refund requests, to each of whom they have written a letter. BluApple has put together a very informative post about why their product is important to use. If you would like that file sent to you, leave your e-mail in the rafflecopter below, and when the contest is over, I will email it out to you. It was very informative for me to read as a produce consumer. I was amazed by all the things I learned in it. BluApple is offering my 3 of my Readers one package of these awesome little things! If you don't want to wait to find out if you've won, you can buy them HERE! Enter the Giveaway Right Here!!! 3 Winners Will be chosen! !